It may be a little early for Awards forecasting, but my dopler has been keen a couple of times in the last five or six years so I might as well take a shot with this film. I see at least two strong acting contenders and a screenplay nomination that will depend on what opens between now and the end of the year. This is easily the most Award worthy film I’ve seen this year so far and I am giving it my highest recommendation. If is manages to get to a theater in your neck of the woods, you should go and see it. It is not perfect in plotting but the dialogue is fantastic and the spine of the story is compelling and relevant. We don’t exactly know why, but two brothers are on a mission to rob a series of bank branches that belong to a local institution in Texas. The robberies are planned and there is a definite element of thinking to the strategy, but in execution, the robbers appear to be less than sharp. The Texas Rangers become involved and a wily soon to be retired investigator has his own theories about how to flush the criminals out. That’s as much of the plot as I’m willing to give up because there are some surprises along the way that you will not want to have spoiled for you. The context of hard times and the stubborn independent streak of West Texas make the film feel fresh in a dozen different places. There is much humor in the film but some of it will seem politically incorrect and might irritate SJW. There is a sense that things are not as they should be and that is partially due to race and class. In the end we are going to be conflicted because both sides in the conflict have given us something to root for. There are three parallel relationships that keep our interest in the film, let’s take them one at a time. First the two brothers in the movie could not be more dissimilar. Chris Pine plays Toby Howard, the younger, very handsome brother who has always been a straight arrow, if not always a success. His older brother Tanner is a wild child, disowned by his mother, convicted by the state of various crimes, and probably guilty of patricide. Ben Foster has been an actor in the periphery of stardom for more than a decade. His Charlie Prince in the remake of ” 3:10 to Yuma” was a flashy part but not big enough to score with critics groups. This part should change that. Tanner is a truculent loser with a sense of self that is humorous at times and frightening in other moments. The two brothers bicker, reminisce, and joke with one another like brothers might. They have not always been close but they understand each other really well. Pine is excellent but his role is the less flashy of the two, and Tanner has some of the best one liners in the film. Both my daughter and I laughed hard at his umbrage when his brother tries to substitute Mr. Pibb for Dr. Pepper. He may not be the smart one, but he is the spark plug that makes this story compelling. The second relationship that is important to our appreciation of the film is the partnership between the two Texas Rangers on the trail of the pair. Gil Birmingham is Alberto Parker, a Native American in the most cowboy job a guy can have. His partner is old timer Marcus Hamilton, a laid back Jeff Bridges. Marcus goes by instinct and cleverness. Alberto is the more traditional Ranger who sees tweekers behind most of the crimes they investigate. It seems that these two are friends most of the time but the jabs they give one another are sometimes done without the sarcastic smile that would indicate that the speaker does not really mean what they are saying. Screenwriter Taylor Sheridan has a ear for what is real and what is tense.Their conversations range all over the place but are deepest when looking at the changing roles of different groups in Texas. Both of them know when they have been put in their place by a local waitress with definite ideas of what it is they should be ordering to eat. The importance of this relationship is what sets up the last of the three major pairings in the film. Toby and Marcus are the third side of this triangle of male relationships. Bridges is using his gruff mumbling voice in this film, a lot like he did in the dud “R.I.P.D.” from a few years ago. In that film the character was overdone but in this film the quirks are perfectly balanced with the thoughtfulness of the character. The gravel in the voice is less affectation and more earned. 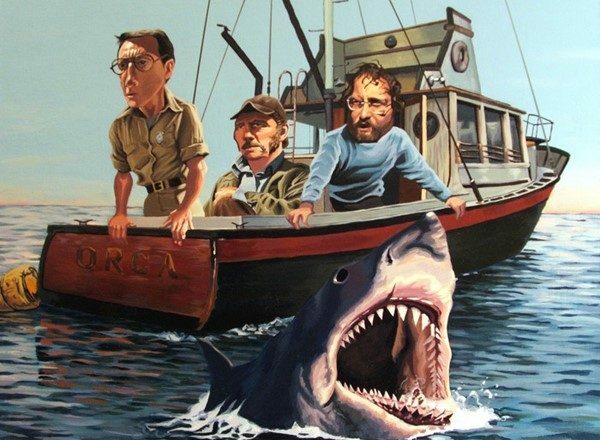 The climax of the film will surprise some people but not fans of 1970s films. The unfulfilled confrontation between the two smart guys in the film is some of the best character dialogue you will hear in movies these days. Bridges and Foster are exterior performances which is why they will get deserving notice but that should not overshadow Pine who becomes a better actor each time he is in a film. His work in this final scene will prove that to anyone willing to watch. There were times in the film when I was reminded of watching one of those car chase films from the seventies. Not the cartoon ones in “Smokey and the Bandit” but the existential films like “Vanishing Point” or even “Dirty Larry, Crazy Mary”. The characters success or failure in the chase was not just a visceral thrill but a moment of significance to the story. The cat and mouse game being played in this film is for big stakes, and we can empathize with each side since they both take significant losses. Also like a 70s film, the scenes develop and build they don’t simply start with a climax and show that. There is purpose behind all of the things that happen in the film. Having made the choice they did, the two brothers story plays out as it must, a tragedy and a double edged success. Bridges stands as the looming figure in the lives of the two brothers, and his quiet, ominous demeanor, is one of the great pleasures of this film. They don’t make Westerns much anymore and the old saying is they “don’t make them like they used to”. 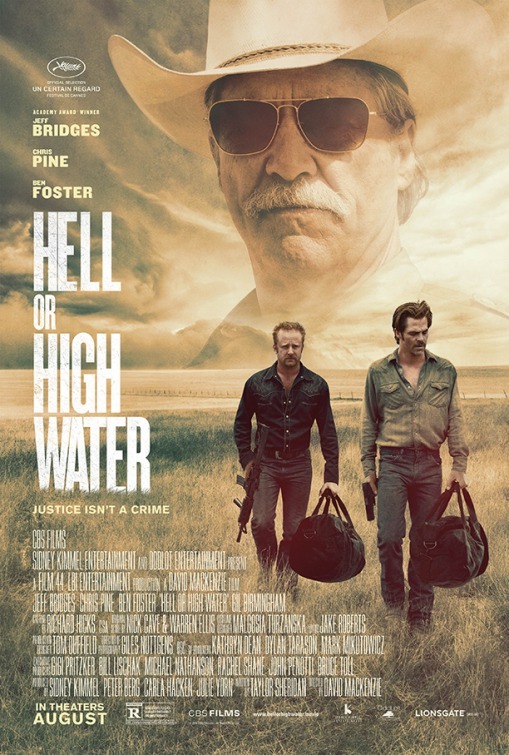 Well “Hell or High Water” is both a Western and made like they used to make them. It is thoughtful, violent, clever and performed at a level that will please audiences substantially. I could hear today’s crowd react several times to moments in the film. They do so because they become invested in the characters. That sort of character driven story is hard to come by in the fast paced action films of the day. This movie will provide the opportunity to follow a story, care about all of the main players, and sit in suspense as we wait for the final moments. You will be hearing about this one again. Make sure you are ready to talk about it by seeing it. One of my favorites for year, for sure. I expected great performances from Bridges and Foster, but it was Chris Pine who really surprised me in this. Wonderful dialogue, cast, and atmosphere all around. Will probably watch again, and soon. Excellent all the way around. I think Pines is terrific, but it takes until that last scene for most people to see it. I’d love to see this gather awards, but I’m afraid people are going to forget about this. Like many did with last year’s SICARIO. I saw the preview and I’m hoping this is a great movie. I want another modern western, like No Country for Old Men. That’s very much what you will get. Ben Foster in not quite Javier Bardem scary, but he is more charming in a bad guy way.